This cabin styled timber frame design is sized for the simplicity of the cottage life, ideal for a weekend getaway or smaller family home. 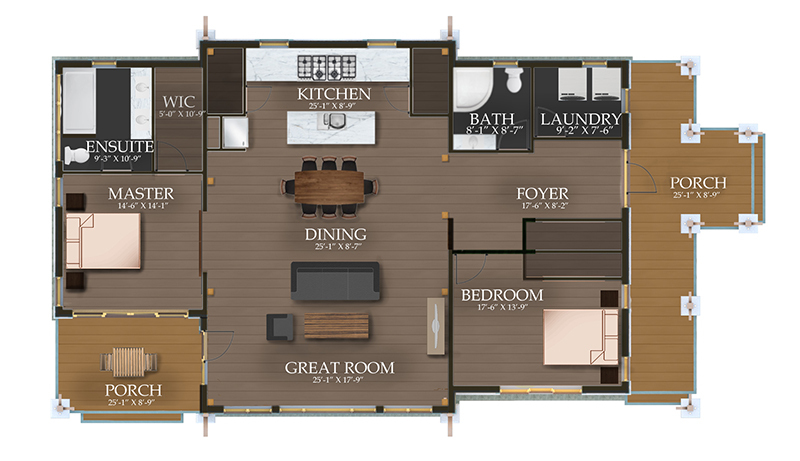 The 2128 sq ft efficient single story floor plan allows for one Bedroom, one Bathroom, Master Suite with ensuite and Walk-in-Closet. The front foyer gives access to the laundry room and bathroom leading to a sizable open concept living space for entertaining friends and family with large windows to enjoy lakeside or mountain valley views. A large covered entry porch is supported by beautiful timber accents providing 412 sq ft of covered deck space at the front and rear porches of the cottage. Curl up in front of the fireplace and feel at home in this cabin styled, cozy cottage space.